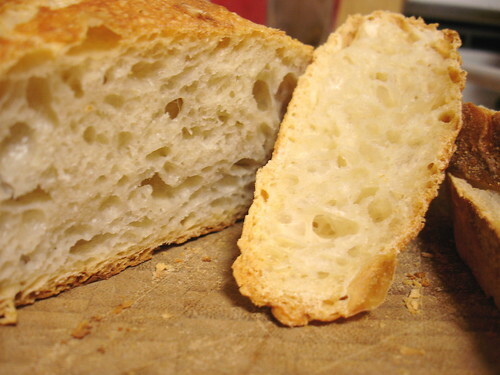 I finally made the recipe every food blogger in the world has been talking about: No Knead Bread. I used www.myaimistrue.com to help me through the process, but a simple google search pulls up plenty of blogs discussing the recipe, plus the original article in the NYT. 1. Mix above in a large bowl and let rise for 12-20 hours. 2. Turn out onto floured surface, fold over a few times. Let rest 15 minutes. 5. 30 minutes before the rise is over, preheat oven to 450Âº and place a 5-8 quart cast iron pot, with lid, in the oven while it heats. 6. Take the hot pot out (be careful! ), sprinkle the bottom with cornmeal and place dough ball in seam side up. 8. Remove lid and bake for an additional 10-20 to brown. Our loaf came out really well, but the crumb was a bit spongy. I think this is just because we neglected to let it cool down properly before slicing it. The crust was fabulous, though! No need to mist in the midst of baking with this loaf! oh don’t get me started on that bread….it is beyond amazing!!!! i hope whoever came up with it [can't remember his name just now] got a lot of money out of sharing the recipe with the world! I’m doing this now, but isn’t the oven very hot i.e. burny?